Two-story type three construction building with heavy smoke showing from the rear of the structure and the roof. The FD was dispatched to our downtown for a reported structure fire. 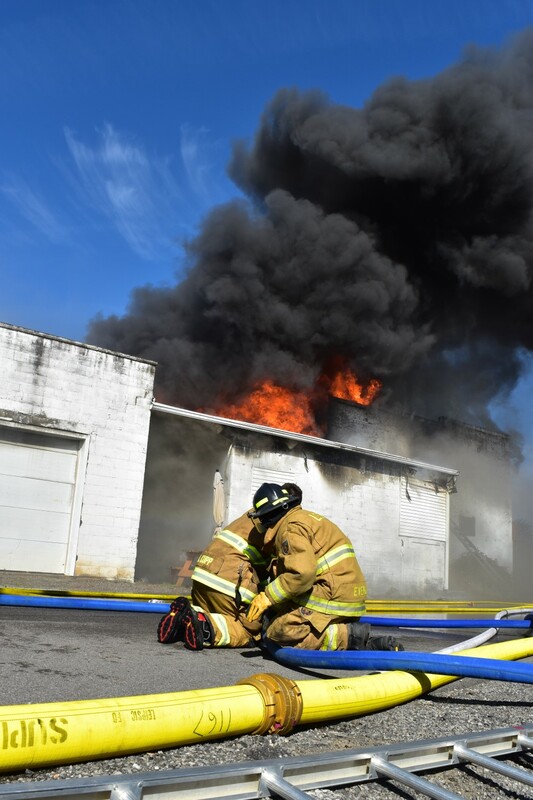 The fire was located in the rear of a 1905 building (Ordinary Construction) that was being used as a storage and assembly occupancy but was unoccupied at the time. 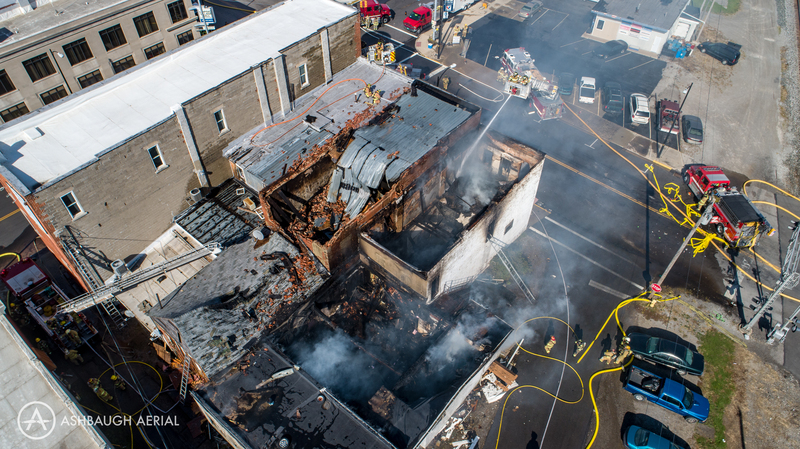 The building involved was the B side building (Building #1) that was in a row of four structures that were originally separated with firewalls (Building #1, #2, #3, and #4). 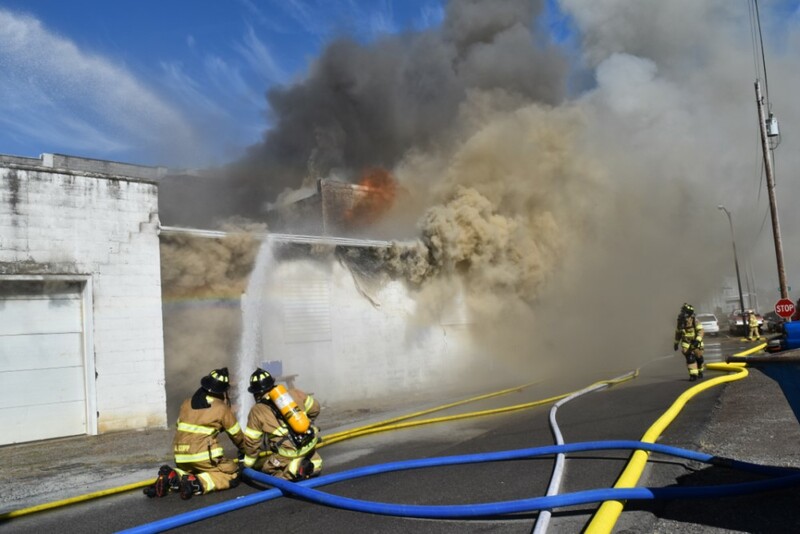 Firefighters attempted an aggressive interior attack on the first building until the fire conditions rapidly deteriorated and a defensive attack was mounted. Several elevated and ground master streams were set up in an attempt to stop the fire. It was decided to send a crew to the roof of the unaffected #3 building and cut a trench cut in the roof of the #2 building. The #3 and #4 building houses residential occupancies and a deli. The fire was traveling at an incredible speed across the cocklofts so we needed to get it stopped. While the trench was being cut, firefighters needed to climb atop the firewall to reach the roofline due to the various height differences. Several seconds into the cut, the roof failed along with the fire wall into the #2 building. The firefighter that was still on the #3 roof was able to pull the second firefighter from the wall just before it collapsed. All firefighters evacuated the roof. Sending experienced firefighters to perform high risk tactics is important. While the trench cut was a major factor in stopping the fire, ICs must really evaluate the risk vs reward. The fire was moving toward a loft apartment residential building, with a popular restaurant on the main floor. This contributed some decision pressure to save these properties. We should have made the trench cut earlier before that area was affected by fire. Other changes may be coming as we review the incident further. Age of the buildings and construction type, along with the amount of time the fire was burning. Rapidly changing fire conditions endanger crew.